Spend some time with us and you'll quickly learn that we're ALL ABOUT: Cooking from scratch. In a nutshell, it means using the freshest ingredients instead of those which are pre-packaged. ...instead buying a frozen veggie burger and heating it up, you see what you have on hand and then begin pulling the ingredients together to make your own from-scratch veggie burger! That's exactly what I did here with these Homemade Veggie Burgers drizzled with a Tahini-Mustard Sauce and Yellow Pepper Relish, served with a side of gorgeous steamed carrots. We'll teach you how to do all of this without a recipe so you use the ingredients you have on hand. What does it mean to cook from scratch? Vegan dips and sauces from scratch. 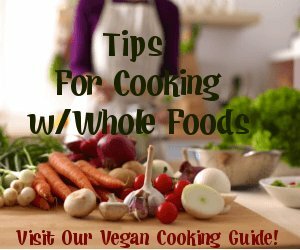 ...means taking (mostly) whole foods from their raw state (like beans, whole grains, and veggies), cooking them up, then mixing and matching to make your very own one-of-a-kind vegan dishes. In fact, once you figure in all the herbs, spices, flavorings, nuts, seeds, and more (!) you'll find you rarely make the same dish twice! We don't just flap our gums over here; we actually practice what we preach. 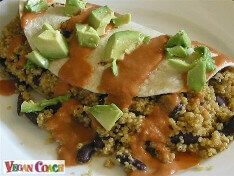 Because we all want to eat healthy and well-balanced vegan meals. We need them to be fast and easy. And we need them to taste yummy! All the dishes below were created with plant-based whole foods. Think of them as mini cooking lessons with some helpful tips and advice along with a tasty and good-for-you homestyle recipe. 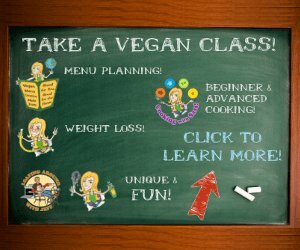 The best way to get on track to a never-ending supply of vegan breakfast ideas is to learn how to cook without recipes. Because when you do, you'll simply go into your kitchen, open the fridge to see what you have to play with, and get cooking! 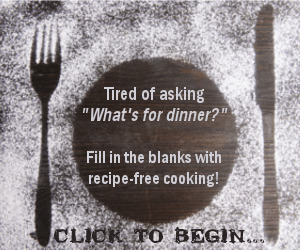 You can have a nutritious and simple meal on the table in minutes. 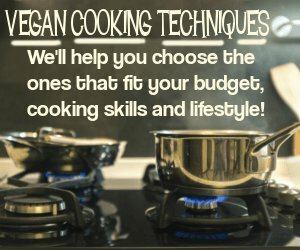 Click here to visit our vegan breakfasts made from scratch without a recipe! "Eating out doesn't appeal to me as much because I know how to make flavorful dishes at home. 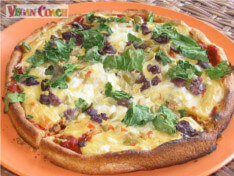 I feel more comfortable creating my own recipes." Soup is incredibly easy to pull together without recipes. In fact, if you're new to recipe-free cooking, then the perfect and easiest way to get started is to learn how to cook soup. 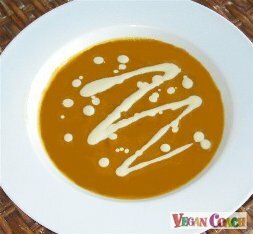 Click for a yummy selection of vegan soups that were created with plant-based whole foods without a recipe in sight. 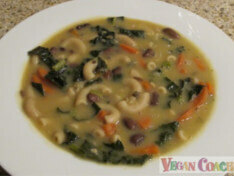 Click here to visit our vegan soups made from scratch without a recipe! "Your approach is exactly what I needed. You make each vegetable, bean and grain seem so easy to make. It's like a whole new world has opened up to me." In the world of cooking, it would seem that the side dish is one of the more basic things you can make. But how many times do you reach for a recipe to pull your side dish together which takes longer than you expect? Simplify your life! When you learn to cook without recipes, you can pull sides together in minute with the ingredients you have on hand. 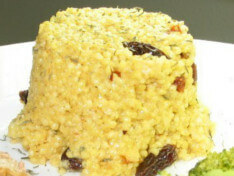 Click here to visit our vegan side dishes made from scratch without a recipe! 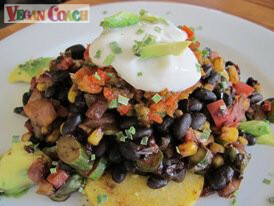 "I love that I've learned how to put everything together with seasonings to create easier, healthy meals without using a recipe: intuitive cooking!" It's far better to learn how to cook main dishes without recipes so you can simply head into your kitchen after a long day, see what ingredients you have on hand to play with and then pull together a meal quickly and easily based on the flavors that you and your family love! No more working with strange ingredients! Recipe-cooking saves time and money AND is a satisfying (and fun!) adventure. 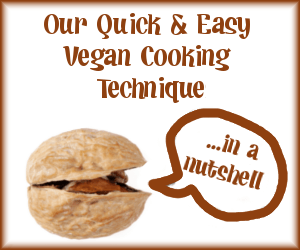 Click here to visit our vegan entrees made from scratch without a recipe! "I like that I don't feel so reliant on recipes now. I can just cook up some veggies, legumes, etc. and dinner is ready." Learn how I whip up healthy vegan sauces in minutes with this helpful tutorial - sauces that will make you drool! Ragout is traditionally made with meat, but here's an easy and scrumptious Vegan Tomato Mushroom Ragout you're sure to love. This can really be used on any veggie you like, so be sure to play around with it. This super simple sauce has just the best flavor and only 3 ingredients. I'm sure you're going to love it too. "I can't wait for mealtime so I can make something really tasty." "I just wanted to say that I simply love your website! I have learned more, with less stress to my brain, than with any other site I've seen. And I've seen a lot! I used to feel that living a healthy lifestyle and cooking from scratch were way beyond my reach. You've helped me "chill out" and find my center in the kitchen, and I just really wanted to say THANK YOU!" "You have been there for me from the very beginning. I had no idea what I was doing 2 1/2 years ago when I went vegan. All I knew is that I HAD to go vegan for the animals and there was no turning back. "Unfortunately, I was not much of a cook and had some tearful first meals. 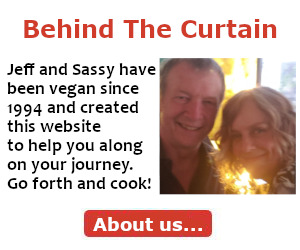 But not long after making the switch I found your website and thanks to you I was able to build confidence, and now I cook great food that my daughter and I enjoy. :-)"
Back to the top - Cooking From Scratch!